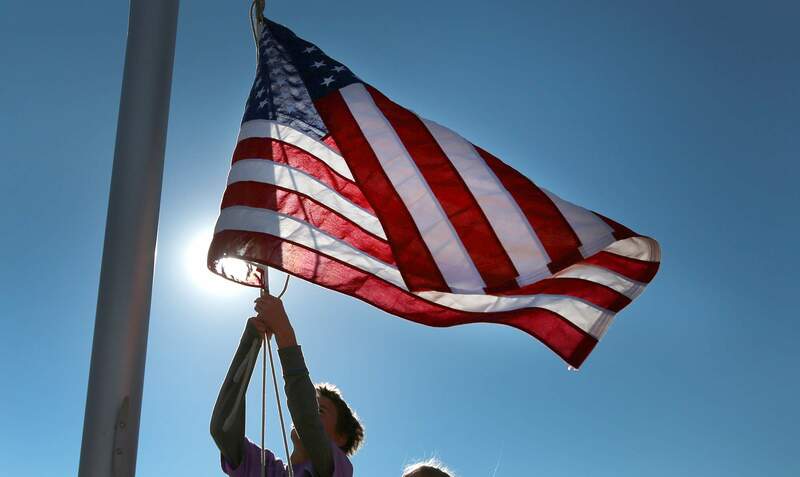 SHAUN STANLEY/Durango Herald - Boden Philippon, a student at Riverview Elementary School, lowers the flag at the end of school in this photo from November, 2015. Most Americans apparently didn’t pay much attention in their U.S. history classes, and many don’t understand how our government works, according to numerous studies and polls. Now, we’ve entered an era where the delivery on social media of propaganda masquerading as news seems to have confounded the problem. So we propose that on this Fourth of July, you take a bit of time before you pop the top on a craft beer to learn something about the country whose birth you are celebrating. And celebrate you should; George Washington gave his soldiers a double ration of rum on this day in 1778. We believe that in these divisive days, it might help to think about what brought us together as a nation in 1776. It wasn’t just about taxes the British levied against the colonists. Other grievances included limiting immigration, refusing to approve needed laws and obstructing justice. Indeed, the colonists listed many grievances in the Declaration of Independence, signed on July 4, 1776. Read it. You can easily find it online. If the 18th-century language mystifies you a bit, there are plenty of explanations online as well. Or read Thomas Paine’s seminal Common Sense, a pamphlet published a few months before the colonists declared independence. It’s longer and more dense, but there are passages that surely will resonate. “Ask not what your country can do for you, but what you can do for your country” – President John F. Kennedy. “True patriotism hates injustice in its own land more than anywhere else” – American lawyer Clarence Darrow. “Patriotism is supporting your country all the time – and your government when it deserves it” – Mark Twain. The Fourth of July has become more of a fun summer holiday than a celebration of our country’s founding. Maybe it’s time to remember that its name is Independence Day. Incidentally, the day wasn’t recognized as a federal holiday until 1941, although it was celebrated annually. John Adams, though, believed it should have celebrated the day when the Continental Congress voted for independence, July 2, 1776. Ironically, he (and Thomas Jefferson) died on July 4, 1826, the 50th anniversary of the signing of the Declaration. “We live in a time of conflict – external and internal – when we sometimes concentrate too much on what divides us.